the nytpicker: Most Embarrassing Mistake In Recent NYT History: Cyn Goodenough Is A Woman. Most Embarrassing Mistake In Recent NYT History: Cyn Goodenough Is A Woman. 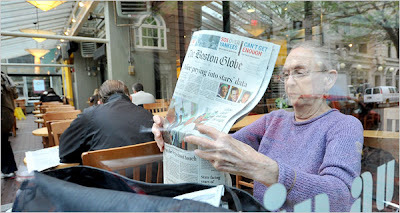 A picture caption on Thursday with an article about an agreement between The New York Times Company and workers at The Boston Globe misstated the gender of Cyn Goodenough, shown reading the Boston newspaper. She is a woman.